OLYMPIA – After 153 days, the Washington Legislature decided Saturday it had had enough, even though Gov. Jay Inslee wanted it to do more. In quick succession, the House and Senate passed a $3.6 billion spending plan for large capital construction projects with large majorities from both parties. In less than an hour, legislators adjourned their second special session and headed home. A short time earlier, the Senate had killed a $10 billion plan for road and bridge projects, which the House passed and Inslee supported. The predominantly Republican majority coalition, which held a tight rein on its members the entire year, defeated a parliamentary measure that could have shocked it back to life. Sen. Mark Schoesler, R-Ritzville, told his members the measure was a procedural vote and, as it has all year, the coalition held together on procedural matters. Sen. Tracey Eide, D-Federal Way, used the parliamentary procedure even though she expected it to fail. “I just wanted them to take ownership of this package failing,” she said. 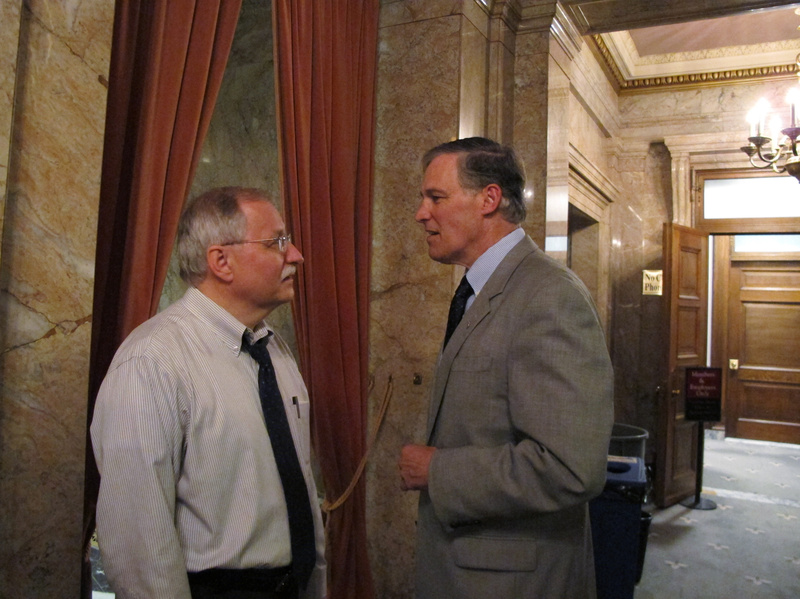 Inslee and Majority Coalition Leader Rodney Tom, D-Medina, traded accusations about who was responsible for a lack of leadership on transportation. Tom said the issue needed more study and the Transportation Department more reform, and the Legislature can work on it over the next six months and take it up next year. The failed package would have raised gasoline taxes by 10.5 cents over the next 12 months and increased other vehicle fees. Among the big projects on its list was the North Spokane Corridor, which was slated for $480 million. But the biggest sticking point was a controversial bridge over the Columbia River from Vancouver to Portland, which some members of the coalition vehemently oppose but Inslee supports. The governor left open the possibility of calling the Legislature back in the fall for another run at the transportation package. By comparison, the capital budget, which covers non-transportation projects, passed both chambers with ease Saturday after an all-night negotiating session between House and Senate leaders. It allows the state to use a portion of the money in the general operating fund, which passed Friday, to pay off bonds that it will sell. • $11.8 million to expand facilities at the Spokane Skills Center in the Hillyard neighborhood. • $2.7 million to buy property near Fairchild Air Force Base and move some homes out of the Accident Potential Zone. • $1.5 million for the Spokane Valley Tech Skills Center to help them offer programs in engineering, entrepreneurship, computer science and other skills employers are seeking. • $1 million for Spokane Public Radio from the Building for the Arts fund to allow the station to purchase a historic building for office and production space and new broadcast studios. • $600,000 to support the Spokane Neighborhood Action Partners’ purchase of the former Dominican Center convent campus. • $250,000 for a new sprinkler system at the Emanuel Family Life Center. • $230,000 to improve a building to allow the Lower Falls Community Center’s youth program to move into the Browne’s Addition neighborhood. Sen. Andy Billig, D-Spokane, called the capital budget a jobs program as well as a boost to community organizations. His Spokane colleagues in the House, Reps. Timm Ormsby and Marcus Riccelli, were instrumental in lobbying to get local projects on the final list, he said. Despite his frustration over the transportation package, Inslee listed some successes from the nearly six months the Legislature spent in session. It passed the $33.6 billion operating budget Friday that averted a partial government shutdown. That budget, which Inslee is scheduled to sign this afternoon, provides an extra $1 billion for public schools and other improvements in higher education without significant cuts to programs for seniors, low-income residents and the homeless, he said. It set up a clean energy fund and a bipartisan task force on climate change. It toughened laws against drunken drivers in a way that could cut down on repeat offenders by keeping them off alcohol through new monitoring programs.